Speaker Paul D. Ryan announced Wednesday he will not run for re-election and will leave Congress at the end of his term. “This has been one of the two greatest honors of my life,” the speaker said. The other, he said, is his role as a husband and father, which he cited as his reason for leaving. “If I’m here for one more term, my kids will only ever have known me as a weekend dad. I just can’t let that happen,” he said. Ryan said he considered retiring after the election, noting that’s supposedly the politically appropriate thing to do, but said in good conscience he couldn’t go out that way because it wouldn’t be fair to his constituents in Wisconsin. “For me to ask them to vote to re-elect me knowing I wasn’t going to stay is simply not being honest,” he said. Ryan said he plans to remain speaker through the end of his term. “I know most speakers don’t go out on their own terms,” he said, but added that former Senate Democratic leader Harry Reid announced his retirement and stayed on in leadership until the end of his term. Ryan shared the news with members of his conference before making his public announcement. Members said Ryan told the conference his decision was based in part on having three high school-age kids and wanting to spend more time with them. The speaker cited the recent tax overhaul and significant investments in defense funding as things he was proud to have accomplished. Ryan’s plan not to seek another term as a congressman in Wisconsin might come as a surprise to his constituents in and around his hometown of Janesville. 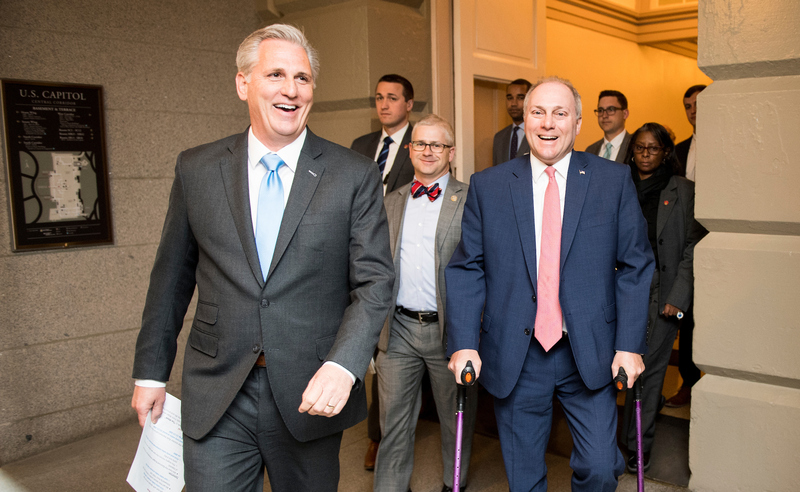 It will also formally set off a frenzy for the role of House Republican leader, which given the current state of the 2018 map may be a race for speaker — or for minority leader. Some high-ranking Republicans who could seek to move up in leadership, like Republican Conference Vice Chairman Doug Collins, Republican Study Committee Chairman Mark Walker and Ways and Means Chairman Kevin Brady, declined to say whether they would be interested in doing so. Ryan didn’t offer an opinion on who should succeed him as leader of the conference — yet. “I have more thoughts on this,” Ryan added, but said now isn’t the time to share those and he’d get into that later. The Wisconsin Republican, who long said his ambition was his previous role as chairman of the Ways and Means Committee, will always be able to point to having pushed a monumental overhaul of the tax code through during his speakership. But the 48-year-old Ryan, who was effectively drafted to be speaker following the announcement that Republican John A. Boehner of Ohio would be stepping aside, will last a little less than three years in the job he assumed Oct. 29, 2015. Democrats were quick to pronounce Ryan’s retirement as a sign of a Democratic wave to come in November. “Stay tuned for more retirements as Republicans increasingly realize that their midterm prospects are doomed,” Law said. Senate Minority Leader Charles E. Schumer struck a more conciliatory tone and said in a statement that he hoped the speaker would spend the remainder of his time in the House reaching across the aisle. “Speaker Ryan is a good man who is always true to his word. Even though we disagreed on most issues, in the areas where we could work together I always found him to be smart, thoughtful, and straightforward,” Schumer said. Ryan said he didn’t think his retirement would have any affect on other House races. “I really don’t think a person’s race for Congress is going to hinge on whether Paul Ryan’s speaker or not,” Ryan said. As for the seat in Wisconsin, Ryan has represented the 1st District since 1998, and has easily won re-election since. Some potential Republican contenders for his seat include Wisconsin state Assembly Speaker Robin Vos and Bryan Steil, a member of the Board of Regents, according to Wisconsin Republican sources. “I think that this comes as a surprise to a lot of people if it is true,” said one GOP operative with experience in Wisconsin. The operative was confident Republicans would hold on to the seat, even with a shorter timeline to build a campaign. “I don’t think that a serious Republican candidate in that district, of which there are many potential, would have trouble raising serious money given the strength of the Wisconsin Republican operation, the strength of the donor network, presumably the support of Paul Ryan and other,” the operative said. President Donald Trump carried the district by 10 points in 2016. GOP presidential nominee Mitt Romney took the district by 5 points in 2012, when Ryan was on the ballot as the vice presidential nominee. Former President Barack Obama carried the district by three points in 2008. Ryan was listed as a Democratic Congressional Campaign Committee target in 2018, and the DCCC added ironworker Randy Bryce to its “Red to Blue” program for promising candidates, which provides additional committee support. Janesville school board member Cathy Myers is also running in the Democratic primary. Bryce had raised a staggering amount of money for a House challenger, thanks in part to his national profile garnered from a viral introduction video and the fact that he was taking on one of the most powerful Republicans. Bryce has raised $4.75 million since jumping into the race, his campaign announced earlier this month. That includes $2.1 million in the first quarter of 2018. Correction 9:15 a.m. | An earlier version of this story misidentified Wisconsin Assembly Speaker Robin Vos.